The most common tuning for a ukulele is G-C-E-A,when each string is played starting at the G it gives us the famous “My dog has fleas!” My (G) Dog (C) Has (E) Fleas (A), a popular method of singing this tuning. These notes (GCEA) make up a C6 chord, The C is the root and bass note, the E is the 3rd, G is the 5th, and the A is the 6th making it a C6 chord. Because the uke only has four strings this C6 is also known as A minor 7 or Am7, but that is a discussion for another time. C6 tuning is also used for lap steel guitars, it is the tuning that gives instruments that “Hawaiian feel.” Most often when you here music that has an island mood to it, C6 is used. It was also common in old country music of Hank Williams and other early stars of that era. Honestly, C6 is a hallmark of the uke. However, there is always room for experimentation with music and it is fun to try some different tunings. Ready to experiment? 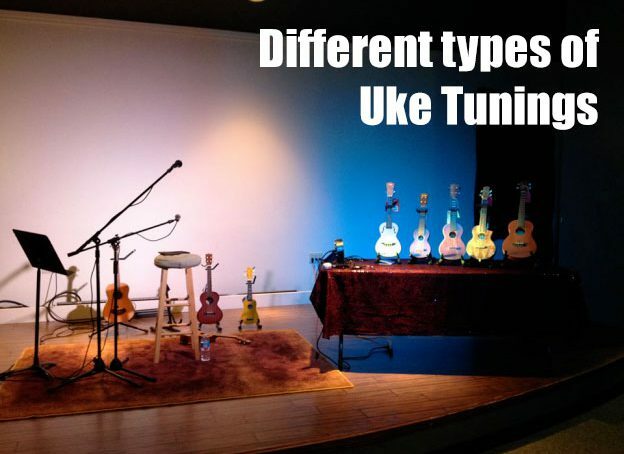 Grab your tuner or visit Uke-Tuner.com, and try one of the following alternate tunings! Ironically this is now an alternate tuning these days, but years ago this is how ukes were normally tuned. Find any sheet music from the 1930’s or before for uke and they often use D tuning which is A-D-F#-B. Now for those who know their music theory we have simply moved a step up in the tuning. A half step is one note and a whole step is two notes so a whole step from G is A, a whole step from C is D, from E to F# (remember there is no E#! ), and the last A to B. If you have ever played in D tuning it has a perfect ukulele sound. It’s surprising that this tuning is not used more often, however by using GCEA the new student has an easier time of learning. D-tuning however should not be overlooked and is perfect for songs that are in the Key of A because it’s easier to play that dreaded E chord! This is not so much an alternate tuning as it is a varying method to tune GCEA. On a normal uke the C string is the lowest note, but occasionally folks like to tune the first G note to a lower G, but that takes a special string. 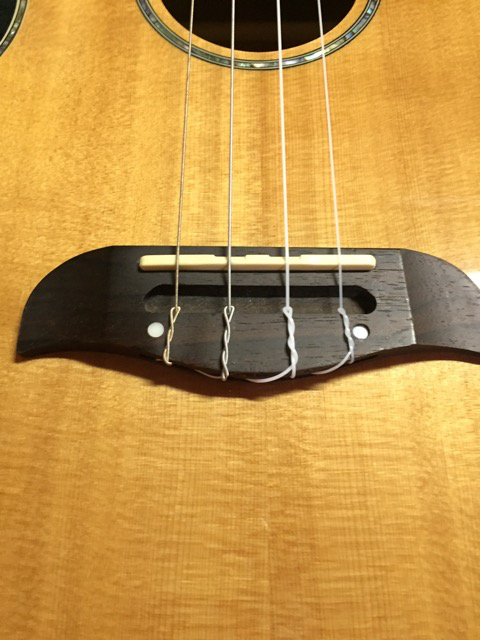 The low G tuning requires a special wound string; you have to order specific strings to make this tuning. The most famous use of this tuning is by Israel Kamakawiwo’ole (known as Iz) in the song “Over The Rainbow.” By far this is the most famous uke song these days and many people do not realize that Iz used a special low G on his uke. These days I prefer to tune my concert and tenor ukulele with a special low G string, I prefer the sound. According to oral historic account slack key tuning originated in Hawaii. It is a method of taking certain strings and detuning or slacking them. To make this tuning you take the last A string and detune it down to G. This means your slack key tuning on the uke is G-C-E-G. Of course this means that all your normal chord positions are different, if you strum all the strings without any frets down you already have a C chord. By moving it two positions up and fretting 2222 you have a D chord. To play a basic C-F-G song you use 0000, 5555, 6666. This tuning works best while playing in the key of C and with C scales. This tuning also works great on many other instruments, especially the guitar. Most folks think about lap steels and guitars for using slide playing. However as long as you are light on the slide you can play slide ukulele! Instead of G-C-E-A change the A to Bb, that gives you G-C-E-Bb which is a C7. The 7th chord is the hallmark of blues, so with a slide uke tuning you can play some slide blues on the uke. You want to make sure you use a slide that isn’t to heavy, remember a simple Bic lighter makes a great slide for instruments. If you want, you can turn the uke on its side and play it like a mini lap steel. The key is that your slide covers all the strings and that you don’t press the slide all the way down to the frets. Just lightly touch all the strings and play your slide uke. In this tuning you are moving the A up to a Bb, so be careful. Whenever you are experimenting with an alternate tuning, always slowly tune anything UP. If you go too far up in tuning you may break the string or damage the instrument. On the uke you are only moving up one and a half steps to Bb so it shouldn’t be too big a deal. This unique slide tuning will allow you to play some great slide blues for the ukulele. You will find this slide tuning works best on concert, tenor, or baritone ukes as the soprano may be a bit small. Baritone ukuleles have always been tuned as DGBE. DGBE is the same as the bottom 4 strings of the guitar. GCEA are 4 steps up from DGBE so to tune the baritone up that high can likely destroy your bari uke! When ukuleles first became popular a player had to experiment with different strings to get GCEA, and potentially hurting their uke. 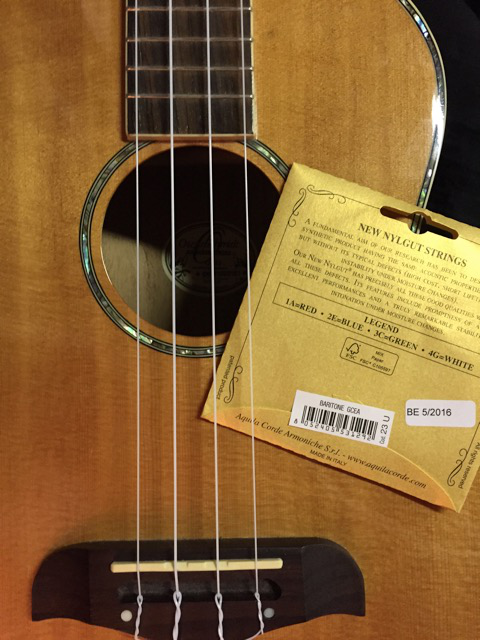 However now there are specific strings made for GCEA and the baritone ukulele. For those who have played with old DGBE strings, it clearly doesn’t have that same sound as a normal ukulele. The original DGBE has more of a tenor guitar feel rather than a ukulele, but now you can get that great uke sound on a baritone uke. I recently changed my baritone uke strings to GCEA, as you can see in the pics below the DGBE requires wound strings on the D and G, but that is not necessary with the GCEA. I truly prefer my baritone uke tuned as a GCEA, just remember you must buy special strings to do this. Take your time when restringing your bari if you are used to DGBE, that way you don’t break any strings! There are so many alternate tunings for instruments out there. Of course the uke only has 4 strings so you are limited in your imagination, but there are still a variety of ways to experiment. Some folks may say “a uke is tuned GCEA! Why bother with anything different!” Well trying alternate tunings is great for your brain, it helps you think critically and get a better understanding of music theory. Experiment, as long you are careful with your uke try different tunings, learn different chord fingerings in those tunings, and you will be able to take you ukulele playing to a new and creative level!